Recently two Pakistani batsmen Azhar Ali and Saad Ali have wished to register their name on the Lords Honours Boards. Whenever any visiting team makes its way to Lords cricket ground to face host in white cricketing dress, it’s always termed as an honour or moment of significance in player’s career to get his name registered on the Lords Honours Boards due to rich history of ground. A player can have his name placed on the list ether by taking a five wicket haul in an innings or 10 wicket haul in a match or by scoring a century in an innings on this historic ground which is also termed as home of cricket. In Pakistan’s current tour of England many of Pakistan’s talented guys had a chance to register themselves at Lord’s Honours Boards by giving healthy performance in first test match of the series. 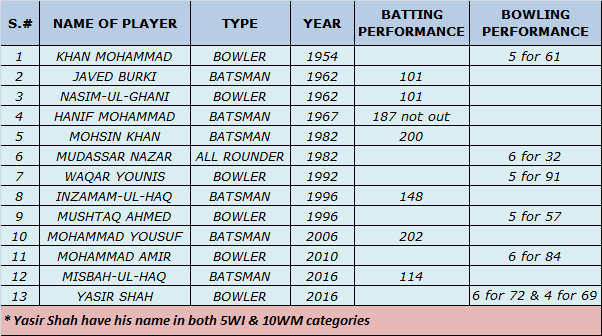 In this blog I will discuss all the power performances of Pakistani’s at Home of cricket during Pakistan’s past tours of England. Pakistan made their first trip to England in 1954 when they visited the inventors of the game. Pakistan at that time was regarded as the baby of cricket due to their thin international exposure. Pakistan’s fast bowler Khan Mohammad became the first Pakistani cricketer who registered his name at Lords Honours Boards by taking 5 wicket haul. It was first test match of the series & Khan Mohammad’s bowling effort restricted England to modest total. It was a commendable bowling effort in which all the victims of Khan Mohammad were clean bowled. He sets up the tone for Pakistan cricketers in England. In Pakistan’s 1962 tour of England, Pakistan played second test match at Lord’s & bundled out for just 100 runs in first innings of the match. With backs to the wall & having deficit of more than 250 runs Pakistan’s than captain Javed Burki comes up to rescue Pakistan & shared partnership of 197 runs with Naseem ul Ghani & during the partnership both the batsman registered their name on Lord’s Honours Boards with scoring exactly 101 runs. Although Pakistan lost the test match by nine wickets but their effort restored some pride for Pakistan in England. During 1967 tour of England, Pakistan opened their tour by facing England at Lord’s cricket ground. After England scored 369 runs in their first innings Pakistan’s batting lost his way after losing 7 wickets for just 139 runs & needed some courageous effort to save the game. The captain Hanif Mohammad led from the front & scored marathon century & neutralize the lead. Hanif scored 187 runs not out of more than 550 balls to save the one end & he got able support from Asif Iqbal who managed to score 76 runs while batting at 9th position. Pakistan was able to draw the match & Hanif got his name at Lords Honours Boards which was just reward for the Pakistani great. In 1982’s visit Pakistan managed to registered their first win at home of cricket when they beat England by 10 wickets in second test match of the series. Pakistan’s captain Imran Khan won the toss & opted to bat, Pakistan’s inning was dominated by opener Mohsin Khan scored fluent double hundred at Lord’s & became the first Pakistani to scored double ton at Lord’s. Pakistan managed to score 428 runs in first attempt. England than followed on by Pakistani bowlers as all chipped in with few wickets to their name. In England second innings a solid batting performance was needed to save the match Pakistan’s unsung hero stood up & broke back of the England batting. Mudassar Nazar who only bowled 4 overs in the first innings & was called on to bowl as a fifth bowler in second innings took 6 wickets for just 32 runs & played pivotal role in Pakistan’s winch. Both Mohsin & Mudassar had their name on the Lords Honours Boards. After Pakistan world cup glory in 1992 Pakistan visited English soil as their first tour after becoming world champion. 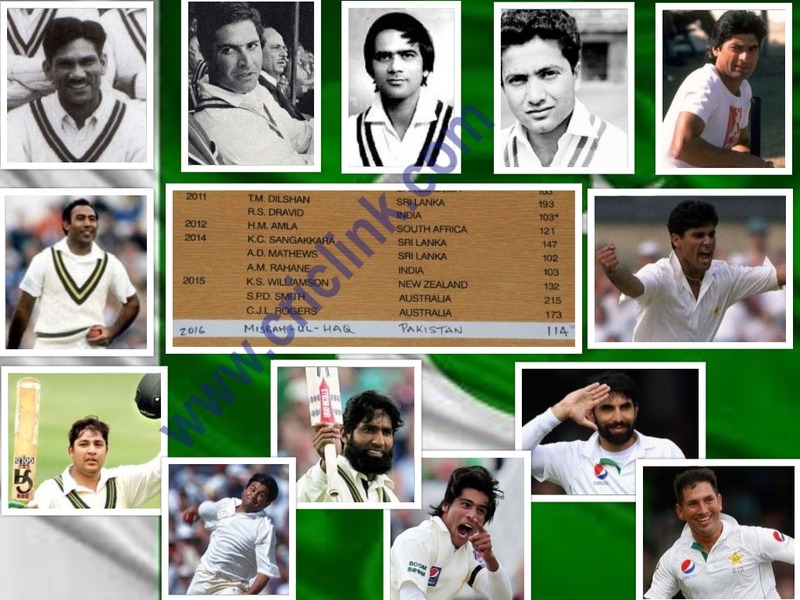 Under the leadership of Javed Miandad Pakistan played second test of the series at Lord’s. Pakistan speed star Waqar Younis grabbed the chance & became the next Pakistani to have his name on the lords honours boards. Waqar took England batting by storm & claimed 5 wickets for 91 runs. Pakistan won the match by just 2 wickets with Wasim Akram & Waqar Younis steering them home. Surprisingly no player other than Waqar Younis from the either side scored hundred or took 5 wicket hauls to have his name on the board in same test match. In 1996 it was once again duo of a batsman & bowler from Pakistan who registered their name on the honour’s board & helped Pakistan to register their second consecutive win at Lord’s. In first match of the series Inzamam ul Haq blasted 148 runs of just 219 balls made Pakistan to score 340 runs in first innings of the. Inzamam’s innings sets up the tone for Pakistan on rest of the series. In fourth innings when England was set to chase more than 400 runs, they got castled by Pakistan’s leg spinning sensation Mushtaq Ahmed. His leg spin & googly bowling earned him a 5 wicket haul & a place at Lord’s honours board. Mushtaq took 5 wickets for just 57 runs & bundled out England under 250 runs to secure a win for Pakistan. In 2006 Pakistan start their tour with a test match scheduled at Lord’s cricket ground. England won the toss & chooses to bat & amassed huge total of 528 runs in first innings. Pakistan’s response was equally good mostly because of the elegant right hander Mohammad Yousuf who became the second Pakistani to score double ton at home of cricket. Mohammad Yousuf’s innings was brace with beautifully timed drives on the off side. He was the last man to get out in Pakistan’s first innings but not before securing Pakistan’s strong position where they won’t lose the match. In 2010 trip to England Pakistan played their last test match at Lord’s. Test which was mostly renowned because of the spot fixing scandal which broke up during the test. One of the Pakistani bowling sensation Mohammad Amir managed to have his name on the Lord’s honours board when he claimed wickets of 6 English batsmen for 84 runs. It was Pakistan’s poor batting performance who led them to a heavy loss & wasted Amir’s bowling effort. During Pakistan’s last tour of England in 2016 Pakistan start their campaign at Lords and under Misbah-ul-Haq and on the first day Misbah lead from the front and scored a century to have his name at Lords Honours Boards and there were more to follow when Yasir Shah picked up six wickets in England first innings and double the honour when he took 4 more in the second innings to register his name twice during a single test match. Next Article Did you know! Graham Gooch had scored most runs in a test match ?